This brown tooled leather belt is made in the United States from top grain leather. It is tooled with a finely sculpted floral design and includes a rectangular silver-tone buckle with a turquoise oval stone at the center. 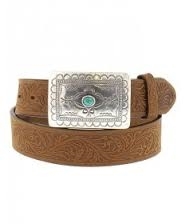 If you are looking for a fine belt with a distinctly Western appeal, try on this belt from Tony Lama.